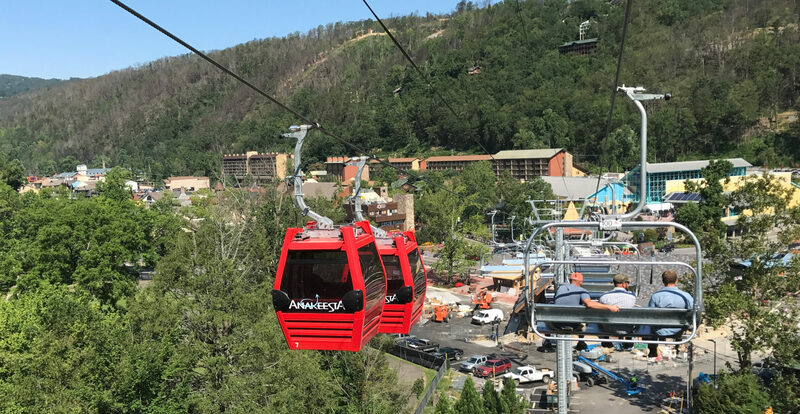 Anakeesta is one of the newest attractions in Gatlinburg, and is gaining attention thanks to its diverse collection of family-oriented activities and beautiful mountain views. Opened in summer of 2017, Anakeesta is a mountain top destination with a shopping and dining village, a children’s tree house playground, a tree canopy walk, and several other activities, including ziplines, a coaster down the mountain, and a chair lift and gondola that goes both up and down. And since the Anakeesta Mountain location has not been open previously, for many people the views from Anakeesta are unique. Every journey to Anakeesta begins with a ride on the Chondola that originates in downtown Gatlinburg and whisks you up 600 feet to the top of the mountain. You can choose to ride in an open-air chair lift that seats a maximum of four people, or in an enclosed cabin which has space for six. The ride lasts approximately 12 minutes, and once you are at the summit you will be ready to experience everything that Anakeesta has to offer. First, you can see the mountain forests from up high on the Tree Canopy Walk. This is a series of bridges spanning the forest trees, and the walk offers great views of the forest floor and the treetops. In between the bridges there are various observation decks where you can learn about the flora and fauna that make the Smoky Mountain ecosystem so unique. Children can have their own mountain adventure at the Treehouse Village Playground, which is open to all ages. Guests who are looking for a little more of a thrill can also race on a set of Dueling Ziplines suspended 60 feet atop the forest floor. You’ll zip across 1,000 feet of lush mountain forests and then rappel off of structures in order to make your way back down safely. Once you’ve had your fill of excitement on the mountain, there’s still plenty to see and do at Anakeesta. Magical Firefly Village is where you’ll find several options for shopping and dining. The Summit Smokehouse is the place to find succulent southern barbecue, including pulled pork and slaw. You can also indulge your sweet tooth at Pearl’s Pie in the Sky, featuring classic pies, refreshing ice cream, and a variety of other baked goods. No trip to the Smokies is complete without a few souvenirs. Anakeesta is home to the Great Outdoors Trading Company, arts, crafts, and other goods made by local artisans. You can also check out Catching Fireflies, a diverse boutique including children’s clothes, toys, jewelry and women’s apparel. Anakeesta offers plenty to keep you busy, but you might want to relax for a minute and enjoy the views of one of the most picturesque locations in the world. During the day, the rolling peaks of the Smokies spread away almost forever. As dusk settles in, you can look below to the glowing lights of bustling Gatlinburg. Anakeesta is the dream of owners Bob and Karen Bentz, a married couple from South Florida who have started multiple successful businesses there. Although they have called South Florida home for several decades, the two met while in college at the University of Tennessee, and also served as Park Rangers together at Great Smoky Mountains National Park. Bob and Karen have returned to the Smoky Mountains regularly since that time, and Anakeesta is the culmination of their vision to share the unique culture of this region with visitors. Anakeesta is open daily beginning at 10:00 AM, and pricing is based on the age of the guest and the types of activities you would like to participate in. Anakeesta is easily accessible from downtown Gatlinburg, at traffic light #5 on Parkway.